Go on an unforgettable holiday in one of Europe’s emerging tourist favourite. With its extensive road network in good to excellent condition; Estonia is fast becoming a destination for a memorable road trip by RV hire. There are also plenty of camping sites and caravan parks sprinkled around the country for those on vacation by Estonia motorhome rental and campervan hire. Estonia has two, year-round international airports at Tallinn in the north and Tartu in the south; so you can choose to go on a one way self drive to enjoy the sights and save time. Compare rates and reserve your recreational vehicle online with Estonia campervan and motorhome rental agents before you travel so you can pick up the keys on arrival and see the top sights right away. Estonia is fast becoming one of Europe’s favourite destinations for its nearly intact medieval Old Town in the capital, Tallinn. But outside its UNESCO-protected ramparts, there’s plenty of nature and architecture to see in this Baltic gem. An easy one-hour drive from Tallinn with an Estonia motorhome rental or campervan hire is Rakvere and its 13th century castle ruins. This town boasts of a scenic coast and postcard-worthy Lahemaa National Park. Make a stop here for urban comforts and rural atmosphere. Follow the coastline to the east in Narva, the closest you can get to Russia – St. Petersburg is 100 miles away. On the way to the south, you’ll encounter falls and nature reserves, arriving at the deep forests and deep blue lakes of this region famed for its historical manors and churches, and the oldest town in the Baltics: Tartu, now a bustling university town. To the west facing the Baltic Sea are holiday resort towns where the sandy beaches of Parnu await. Soothe aching muscles at the spas of Haapsalu where there’s a caravan park for your Estonia motorhome rental. Or bring your binoculars for a day of birdwatching at the “land of bogs,” Soomaa National Park. Traces of Soviet rule are easy enough to see in Paldiski, a deserted Soviet Army base that is now easily accessible on a day trip from Tallinn. Before the Russians, Scandinavian kings and Teutonic Knights ruled over this land, who left behind a rich legacy of manor houses, about 200 of which are under state protection. 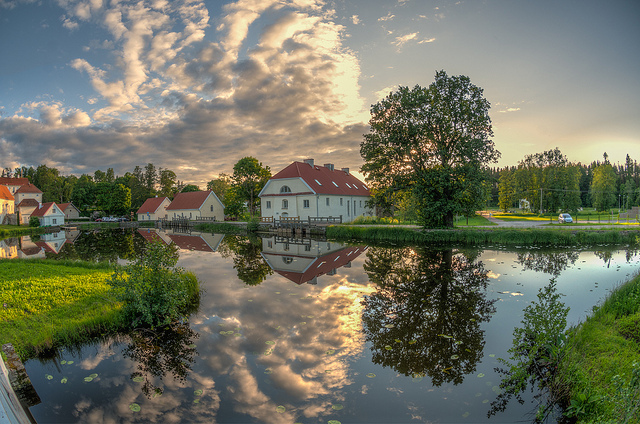 Surprisingly, Estonia has more than 1,500 islands easily accessible via a short ferry ride from the west coast. Some of the most popular are Saaremaa and Hiiumaa, two of its largest islands. They are covered in juniper groves and pine forests, with very few signs of development save for 19th century lighthouses and windmills. There are also plenty of camping, hiking, cycling, sailing and fishing opportunities in some of the smaller islands. For those looking at travelling further afield, one way motorhome rentals from Estonia are available to the Scandinavian countries of Norway, Sweden and Finland. Drive on the right-hand side of the road; overtake on the left. Everyone in the vehicle should wear a seatbelt; children below 12 but not yet tall enough for an adult seat belt should use a child restraint or child-seat adjusted to their size. Observe the following speed limits while driving in these places: towns and villages up to 50 kph, on roads up to 90 kph, and on motorways up to 100kph, with a top speed of 110 kph in summer. Observe defensive driving, as road accidents here related to driving under the influence of alcohol are higher than in most of Europe. Don’t drink and drive. Blood alcohol content when driving should be zero. Estonia has zero-tolerance laws when it comes to drinking under the influence. Don’t drive and use mobile phones unless it’s a hands-free device. Otherwise, it’s illegal. Don’t overtake a tram that has stopped to take on passengers or let them out. Always give way to pedestrians, even in unregulated crossroads. Drive with a clean number plate, otherwise you may get a fine. Most foreign driver licenses are allowed. However if using a non EU license, we recommend obtaining an official International Drivers Permit from your country of residence (please beware of internet scams!). You will still need to carry your local drivers license.